Mankind has managed to achieve some amazing architectural and engineering feats. From man-made islands to enormous buildings, we’ve found a way to re-imagine the world around us and transform it into something extremely beautiful. And after all this work, we sometimes need to simply relax and enjoy a few moments of serenity. It’s not surprising that designers and engineers have also managed to create some of the most comforting and calming experiences as well, in the form of custom-built bodies of water we simply call pools. From a suspended swimming pool which features amazing views of whole cities, to creative in-house swimming pools, here are 10 of the most amazing pools in the world! 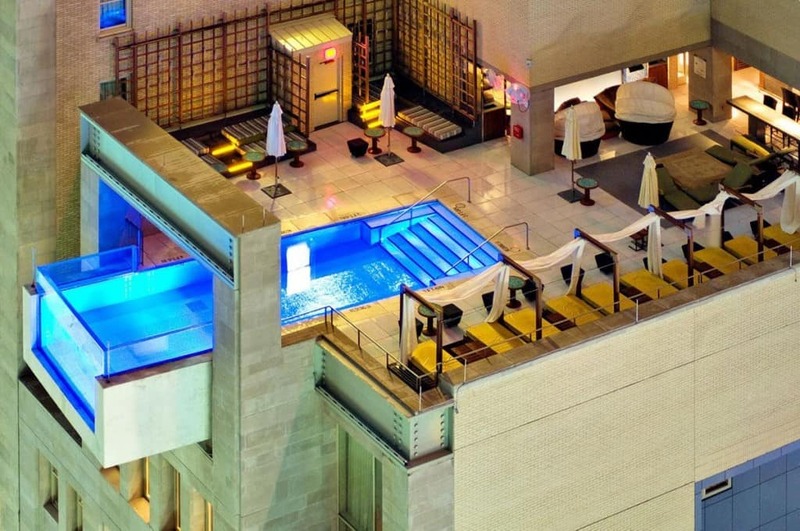 Extravagant and unusual, the pool of the Joule Hotel in Dallas is also one of the most creative pools in the world. Extruded out of the balconies of its building, the swimming pool is definitely amazing! 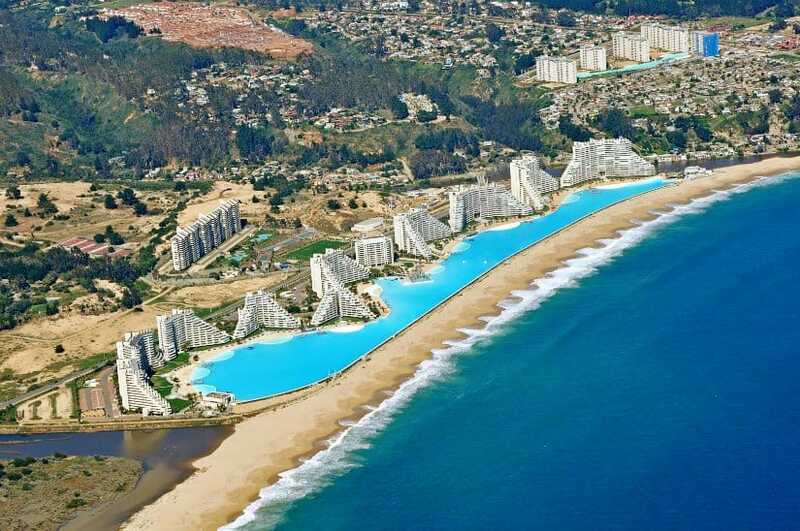 Currently being the largest swimming pool in the world, the San Alfonso del Mar Seawater Pool in Chile is as much as 3,323 feet long. Covering 20 acres and being as much as 11.5 feet in depth at its deepest point, the pool is also one of the few swimming pools to be entirely filled with sea water. If you’ve ever wanted to go swimming alongside fishes and sharks, you should definitely visit the Aquarium Pool at the Golden Nugget hotel in Las Vegas. 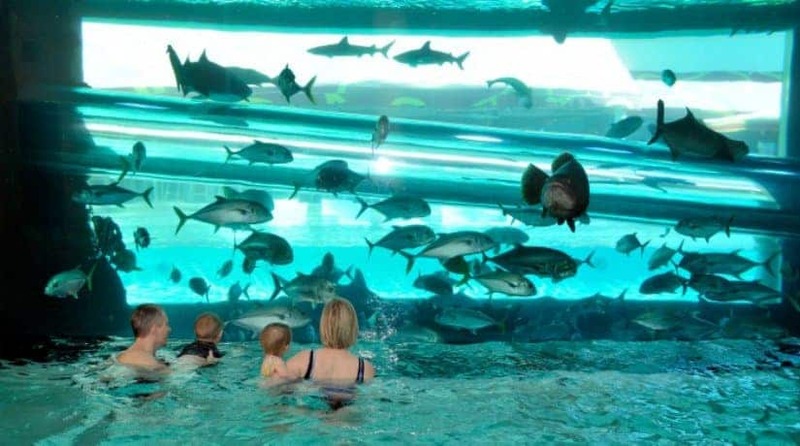 Offering the visitors a unique experience, this pool is definitely a must-visit for every marine life enthusiast! 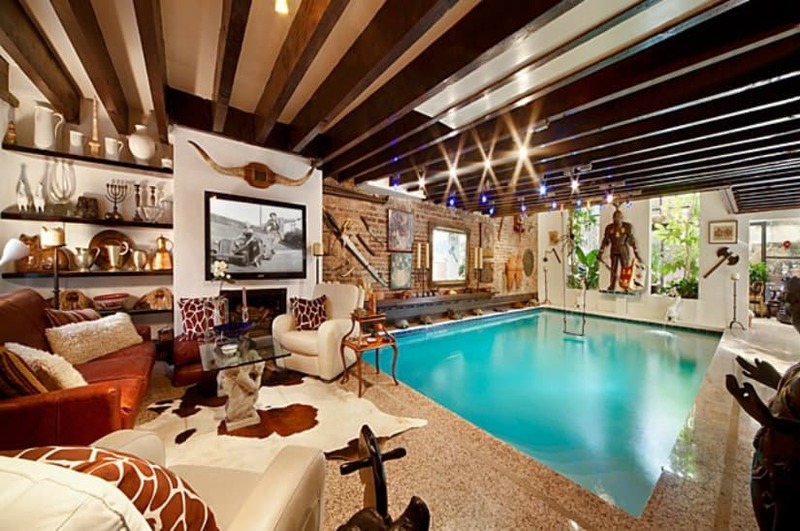 For those of you who prefer the comfort of the home, but you’d still want to have an extravagant pool, you might as well do something like the swimming pool found at the 232 West 15th Street historic townhouse in-door swimming pool. With just the right amounts of crazy and cool mixed together, the townhouse may not be so extraordinary outside, but it is definitely a blast on the inside! 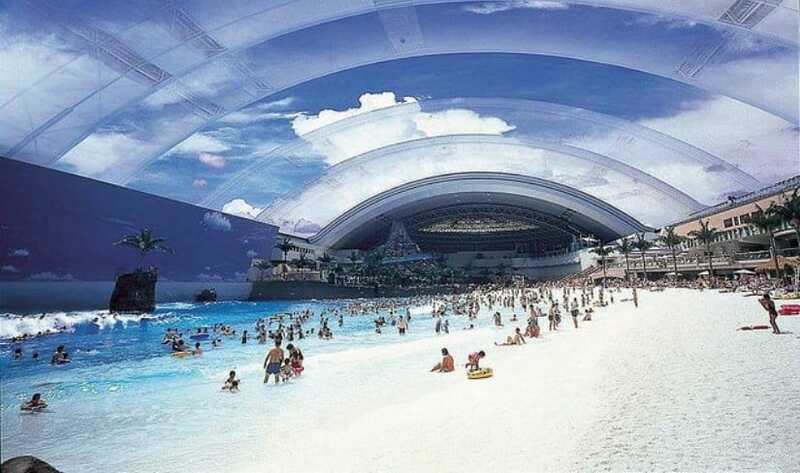 The Seagaia Ocean Dome in Japan is not only one of the largest, measuring up to 984 feet by 328 feet, but it also has a retractable roof and can give you the simulated comfort of the seaside even when it’s raining outside! We can’t do a list of the most amazing pools in the world without even mentioning the infinity pool at the Marina Bay Sands Skypark. On top of the insane 55-stories hotel, the pool cost as much as $6 million to build. If you are one for crazy house architecture ideas, you’d love the Shaw House’s Pool design in Vancouver. Being a 285-square-meter residence for a single individual, the Shaw House has not only everything you’d need to feel comfortable, including a study, bedroom, and a music room, but also features an amazing lap pool located on the roof. 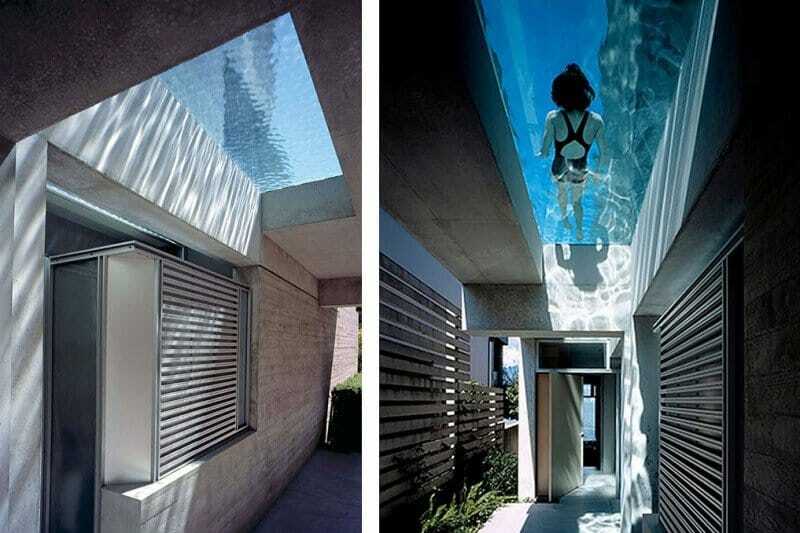 What’s even cooler is that the pool acts as a ceiling in the central area of the house! Awesome! We’ve talked about the largest, but now we must talk about the deepest! For the divers enthusiast, Nemo 33 goes all the way down to 115 feet in depth. 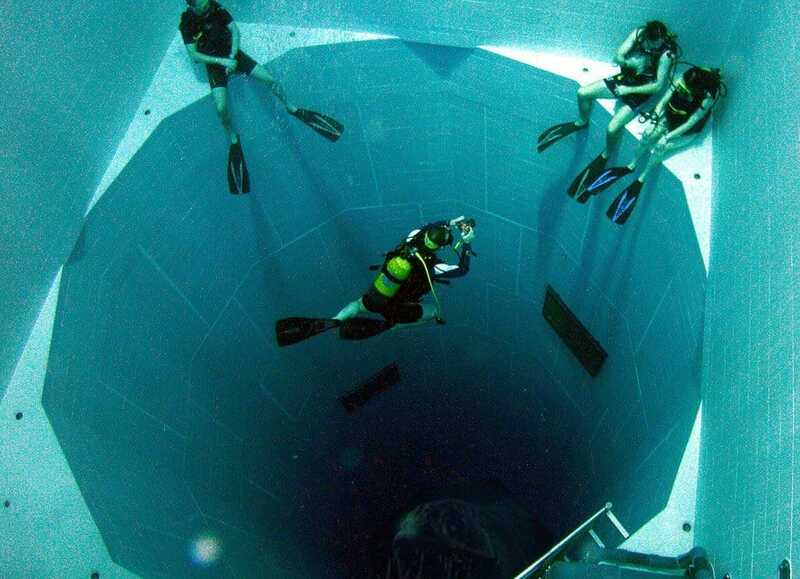 The deepest pool in the world it is commonly used for scuba diving courses. 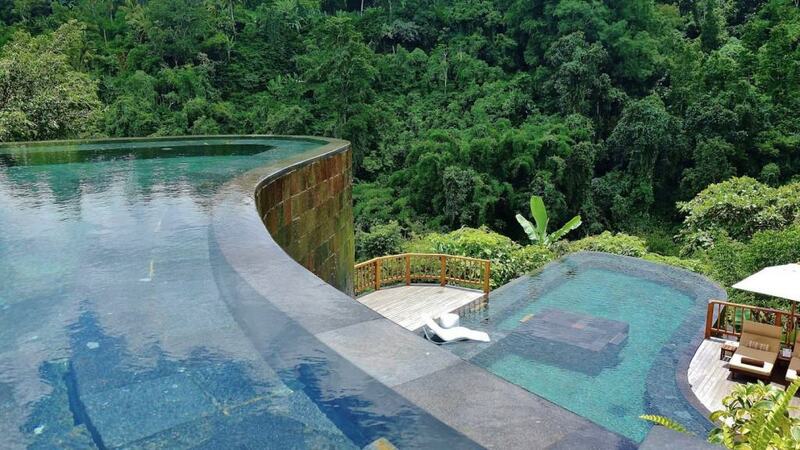 A luxury resort set in the middle of a land filled with forests, volcanoes and much more, the Ubud Hanging Gardens Resort in Bali also features a hanging pool, which is definitely one of the most awesome in the world. 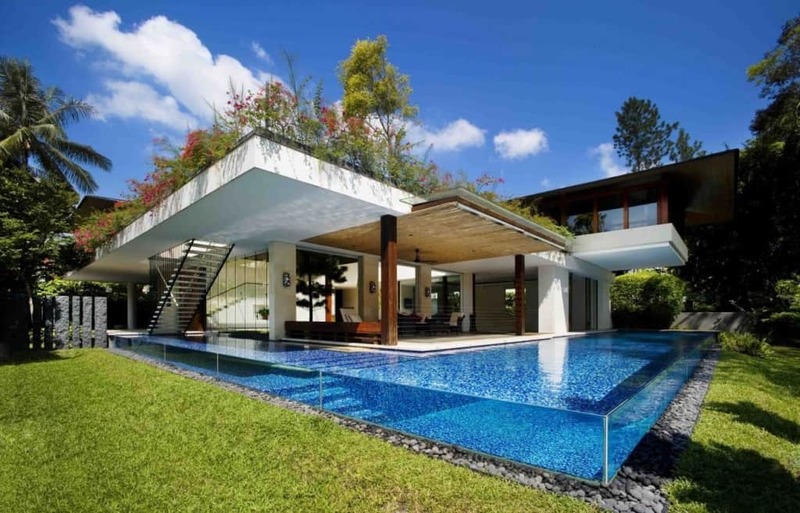 Another crazy architectural idea for home design is featured on the Tangga House in Singapore. Why have a garden in your backyard when you can have it on your rooftop and leave space for a border-less swimming pool instead? That’s just what the creators of the Tangga House did and the results are simply extraordinary and amazing!